Like all actors, she is a chameleon portraying a myriad of different characters. Cate Blanchett first won the British Academy Award for Best Actress, a Golden Globe award, and received her first Academy Award nomination, for her role as Queen Elizabeth the first, in Elizabeth. She was only 29. Since then she has won Oscars for both Best Actress in a Leading Role and Best Actress in a Supporting Role. There is an element of grace and beauty in many of the characters she plays, not least of which Galadriel, in the Lord of the Rings and the Hobbit. I can�t help feel that there is something of the essence of Cate in the Elf Queen. As the keeper of one of the magic rings, Galadriel was a guardian of all that the Elves held dear and that was nature above all else. Galadriel, like Cate, may well have been a Taurus. Cate Blanchett was born 14 May 1969. Taurus is an earth sign and is one of the signs most linked with gardening, a love of animals and the environment. Taureans are conservationists by nature and Cate appears to be no exception. In 2007 she became the ambassador for the Australian Conservation Foundation�s online campaign. Their aim is to provide a forum through which Australians can express their concerns about climate change. With the Sun opposite Neptune, Cate has a sensitive and compassionate nature. You can see this in other causes that she champions. She is the Patron of the development charity Solar Aid, an international charity working to create a market for solar lights in Africa. There is an additional aim of reducing global poverty. 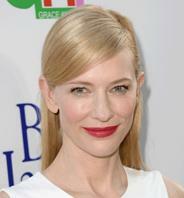 Earlier this year, Cate took part in an initiative to promote sustainable fashion, the Green Carpet Challenge. She wore a pair of Fair Mined earrings containing responsibly-sourced diamonds. True to Taurus, Cate Blanchett works hard, is dedicated to her work and has a love of environmental and charitable causes. This dedication takes passion and the question is, where is this fire coming from? If she was born before 6 pm, her Moon is likely to be in Aries. She also has Mars in fiery Sagittarius. Her mother was a teacher and property developer. This shows initiative and entrepreneurial flair, traits associated with Aries. Cate has clearly inherited her mother�s dynamic energy. Her instincts are to keep active, and push herself forward. Sagittarius is about teaching, faith and sharing what you learn. This is very important to her. It�s not just on the screen that I eagerly wait to see what Cate will do next. Her compassion and strong sense of ethics makes her one of our most interesting and compelling stars.